I don’t have an excuse for using this picture, I just liked it. Okay. Agents. This post came about because I was running a workshop where someone brought up the topic of agents. Take a look through the Australian Writers Market Place, which is available through your library, or you can subscribe to the up to date online version here. This will give you an idea of who is out there and what genres they represent. You can send them a proposal. (Synopsis and three chapters). Or can can attend a conference or festival sign on for a pitching opportunity and pitch to them. See here for a list of pitching opportunities. Say you do get a nibble from an agent, but something strikes you as a bit odd. The money flows from the publisher (via the agent if you have one) to the author. The money should not flow to an agent before they have sold anything of yours. ( Agents’ percentage is 12.5 to 15%). So there should be no reading fee to look at your work. 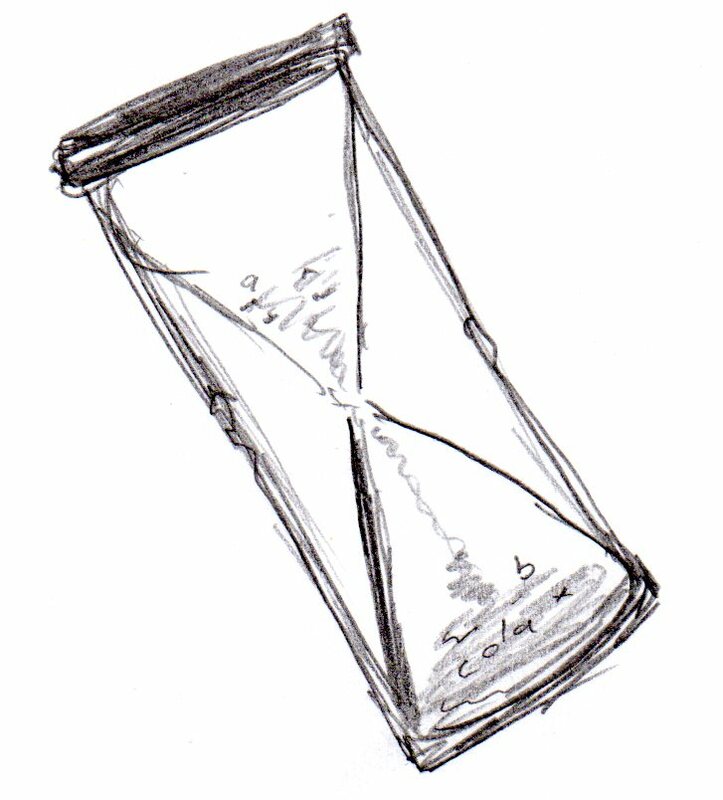 If an agent says that your work is nearly ready, but it needs polishing and they happen to know a manuscript appraiser you should use, and they hint that they will be much more favourable about representing you after you’ve used this appraiser, they are probably getting a kickback from the manuscript appraiser. Don’t trust them. Your agent should not charge you for photocopies or phone calls. My agent accepts my book as an email attachment, he sends it to the publisher the same way. Their editor goes through the book using track changes and they send me the edited book for approval via email. Nothing gets photocopied or printed. Is the agent a member of the Australian Literary Agents Association? Here is their code of practice. And here are their tips on finding an agent. What does a Literary Agent agreement look like? Thanks to the Australian Society of Authors for their support. Skim down this page to find the Literary Agent & Author Agreement. Hope you find this useful. Any questions feel free to ask. Meanwhile check out Predators & Editors — a really useful site. 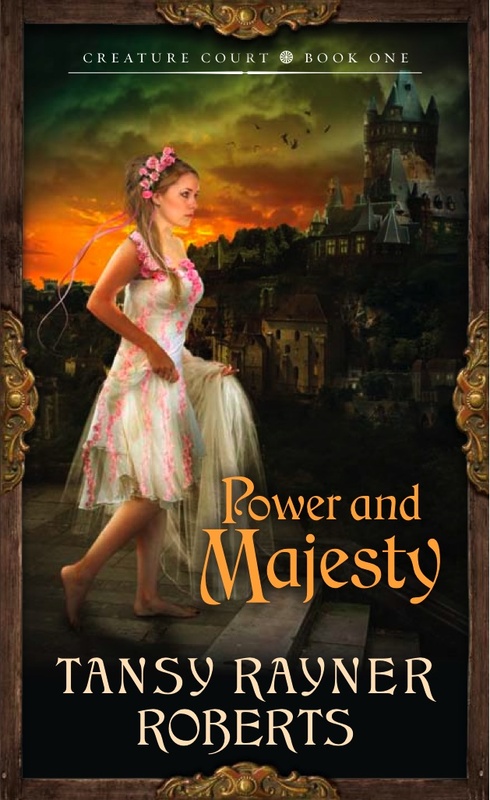 Tansy Rayner Robert’s book one of The Creature Court Power and Majesty should be showing up in bookstores from today – though some places may not get it out onto the shelves until early next week. Make sure you get your copy while it’s still box-fresh. You won’t regret it. There’s this argument that fantasy should be timeless, that to anchor a story in the now is to somehow give fiction a use-by date, that it’s the writer’s aim, to produce timeless prose, and that you should avoid pop-cultural references because they immediately date a novel. Well, listen up, all fiction has a use-by date (usually six to twelve weeks after publication*). When I write Urban Fantasy I’m writing about the now: my characters’ now. Which in the Death Works series is pretty much 2010. If you’re writing about people in their mid-late twenties early thirties who actually engage in the world as opposed to being separate from their culture. Well, they’re going to be listening to contemporary music. They’re going to be using some sort of social media – and probably bitching about it. And they’re going to have a pretty sophisticated knowledge of how media works and interacts with their lives. Which means, dependent on the group, they’re going to watch read, listen to, and eat things of their time. Which means Pop Culture. And if you do it well, it really shouldn’t date your fiction. What dates fiction isn’t the mise-en-scene, it’s the social mores and assumptions within. It’s the writer themselves. Timeless fiction, is at once deeply of its time and universal (easy, right). You’ve got no control over that, but one thing that won’t create timeless prose is a series of arbitrary rules – including this one. Our society, our time, gives us taste, colour, vocabulary. Be careful that if you’re aiming for timeless prose what you’re not really aiming for is bland. That’s simple enough without trying. Leave Time to sort out the timeless, and just write the best you can. What fiction do you think is truly timeless? *OK, I work in a bookstore, where my main job is to do returns (that is send back the books that don’t sell), and I have run the returns department at several bookstores. My view on the lifecycle of a book is a bit different to most readers and writers. I’ve been watching season one of Bewitched with my five-year-old daughter, which brings up all kinds of interesting discussion topics (never mind the dodgy gender politics, the smoking, ye gods, all the smoking!) and which, for the most part, she seems to be enjoying. What occurred to me, in between all the gnashing of my teeth at Darrin calling Samantha a liar when she swears she didn’t use magic to come up with advertising ideas which are slightly less daft than his own, is that the thing which always intrigued me about this show was the invisible worldbuilding. 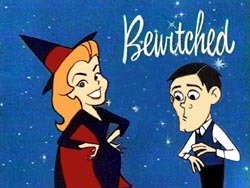 The point of Bewitched is that Samantha has given up her life as a witch in order to become a suburban housewife. Her old life intrudes on the new one through the interference of various members of her family, mostly her mother Endora, but eventually including a whole host of witchy and warlocky types, and we piece together aspects of Samantha’s past based on the clues given, but there is still a lot we are not told. One of the elements of magic that is often emphasised is its decadence. Endora and indeed Samantha reminisce about ways in which they have used magic to enhance their lives, and it is almost always the kind of glamorous activities that could just as easily be accomplished by having pots of money – having anything they want at the snap of the fingers, travelling to exotic places for frivolous reasons, and so on. But there is also a magical world out there, beyond Samantha and Darrin’s suburbia, and beyond even the Paris cafe tables to which Endora repeatedly tries to lure Samantha. We hear about it in snatches, bits and pieces, hints about a Witches Council, or the proper uses of newt, or what they really get up to on brooms. When Sam’s father Maurice joins the cast, his penchant for telling elaborate stories does much to add to the idea of that witchy world and how it works. Dialogue, the Good the Bad and the Ugly. Really bad dialogue can make us throw a book across a room. It can break the ‘immersion’ in a book or a movie. Good dialogue has a natural rhythm depending on the character and their time period. For an exampleof good dialogue that acknowledges its time period but isn’t repressed by it, take a look at the British TV series, Desperate Romantics, based on the Pre-Raphaelite Brotherhood. The web contains lots of useful information on writing craft. Here is a post by Matthew Cheney, Mumpsimus, on how to write dialogue, with some useful links. Here’s another one from the writer’s toolbox there’s this article, on snappy dialogue which covers the basics. Over here at Suite 101, they discuss ways to short your dialogue and add more emotion with more deliberate dialogue. And then we have this article from award winning writer, Anne Gracie, about writing romantic comedy. A lot can be learnt from the craft of romance writing. They have to sustain the interest with predominantly the (sexual tension) tension between characters. It struck me that good screen plays were the perfect example of great dialogue. In a screen play you have to distil the dialogue. It has to be said by a character, so it can’t sound stilted and it has to reveal character because you can’t use introspection. 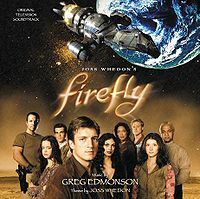 For instance in Firefly, there’s a scene towards the end of episode 9 (Ariel). When the crew return to a central world controlled by the Alliance to steal medical supplies, Jayne betrays River and Simon to the Alliance. It all goes wrong and the crew just escape. But Mal, captain of the Firefly knows that it was Jayne who betrayed them. As the ship is taking off he shuts Jayne in the cargo bay airlock, exposed to the elements. (A modern version of walking the plank). Mal is going to leave him there to die but, as he walks off, Jayne says ‘Don’t tell the others it was me.’ (This is from memory, my son has borrowed Firefly). The subtext is that Jayne regrets what he has done, regrets betraying his friendships. He knows he is going to die, but he doesn’t want his shipmates knowing it was him, who betrayed them. Mal decides to give him a second chance and lets him in. Mal doesn’t need a paragraph of introspection. We can deduce his thought processes from the context. That’s what great dialogue is all about. It relies on context, characterisation and subtext. Silence. In film it can be used really effectively. Silence doesn’t quite have the same impact in a book. If one character asks a question of another character and all they do is look enigmatic, it allows the reader and the character who asked the question to speculate on what is not being said. Not answering a direct question, answers it in another way. Answering with a diversionary answer, tells us a lot about the character. Subtext is really important. 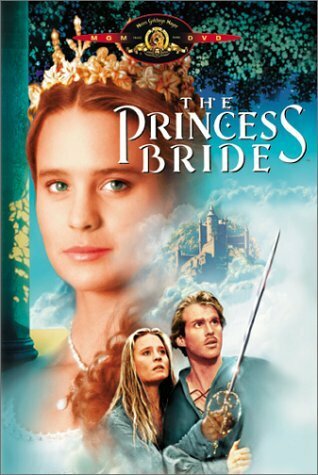 And then there is The Princess Bride. This film contains more quoted dialogue than nay other single film. See quotes here. My favourite revenge scene would have to be this one. Why? Because of the build up. So once again, it comes down to context and characteristation. Inigo Montoya: Hello, my name is Inigo Montoya. You killed my father. Prepare to die. So there you have it, context, characterisation and subtext. Easy! What memorable dialogue have you come across in movies or books? In other stuff-ups, the weekend trains to the airport which are normally so handy for me are afflicted with trackwork, so Aileen will drive me in instead. Aileen’s birthday falls round about the time when I’m travelling from New York to London, so we’ll be do birthday dinner out and birthday presents tonight. I’m trusting that nothing desperately last-minute-y comes up, because there won’t be any time much tomorrow morning. 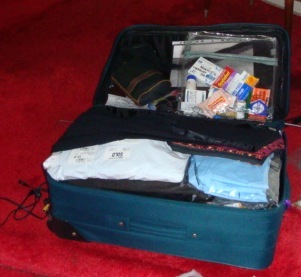 Here’s a photo of my suitcase. Looks so small and innocent, doesn’t it? But it weighs a ton – exactly 23 kilos now. Wish me luck! This should be fun! I was going to put up a post on pop-culture references, but I think I’ll leave that until next week. Instead, and briefly, I thought I’d write something about not being sensible. Sometimes when you teach writing, what you are really teaching is the middle ground. The things to be aware of, the things to cut from your writing, bad habits etc. What’s harder to teach is how to let go. How to go OTT. Because sometimes you have to. I’m excited by prose that is controlled and reckless, dark and light, and sometimes it’s not about having a sensible amount of recklessness, or a reasonable amount of experiment, it’s about letting go entirely. We (that’s a generalised we, and possibly a meaningless one generated to produce this argument – shoot yourself in the foot much, trent?) sometimes have an image of writing as being only one true thing: disciplined, functional, a carriage for the story, which is all well and good. But why shouldn’t it be something else too, why can’t it be like lightning on occasion, random, shocking and powerful? William Burroughs comes to mind for me, and William Faulkner, and Emily Brontë too. Let me stress that I’m not talking about the process of the writing, or the polishing of the prose, but the writing itself. Come to think of it it’s there in all the writers I love. Now, I know I’m being a bit vague (more than a bit) and trying to describe the intangible. But I think I’m on to something – or maybe I’m just tired. Whose prose does this to you? Whose stories have gone totally OTT and carried you along with them? I better get back to my proofs. I had a very authory sort of day today. Two great writing sessions; I’m powering towards the final act or possibly the penultimate act of Book 3 (kind of depends on how long the book wants to be) and I finally managed to wreak some serious death and destruction, hooray! I got an email from my editor at Voyager about cover ideas and had to spend the next half hour googling ballgowns. Yes, I DID have to do that. She called while I was googling and we chatted about a few things including new names for Books 2 & 3. I have one for 3 which works well, but we are still noodling around on 2. Nothing is perfect yet. And the more you think about these things… well, yes. I also managed a bit of exercise, a bit of housework, a bit of blogging, a bit of shopping and a bit of reading. All this and I racked up the biggest wordcount I have in the last month and a half – around 2500 words though I wrote more than that – I also deleted quite a chunk! Had to be done. Pretty much a perfect work day, actually. Which is a good thing, because Tuesday with the baby in daycare for the afternoon and my 5 year old picked up from school by my Dad, is the most child-free it ever gets around here. I did my first stint of writing in the morning while the baby was napping, and did all the other jobs pretty much around her. Having from 1pm until 5pm on my own in the house felt like a huge luxury – and indeed, it’s the first time I’ve had a day like that in four weeks thanks to an after school sports program that mucked my schedule up. I won’t get another day like today for a week! My final act of authoriness was to upload my new podcast, CreatureCourtCast#1, which contains me talking about my new book a little and reading the first chapter. I’ll be doing a few more of these over the next month because they are fun and you get to listen to me failing utterly to do manly voices, and using all the voice trills I have acquired from 5 years of reading Wind in the Willows and Charlie and Lola books. You can check it out on my site, and you should be able to find it on iTunes by tomorrow if you search for ‘tansy rayner roberts’ or ‘creature court’ or something along those lines. If you like the CreatureCourtCast, you might also like to check out Galactic Suburbia, the SF chatty podcast I do with Alisa Krasnostein & Random Alex. We talk about… stuff. Books, awards, etc. I take off my author hat and put the reader & critic one on. Possibly that is two hats. So think of me tomorrow! I may well spend a lot of it sitting in my car, letting the baby nap in the back seat while I tap on my internet-deprived laptop and/or read Joanna Russ books. I fly off in just 4 days time! Agggh! So much preparing and packing still to do. Why do I always leave things till the last moment? Maybe it’s what I do in my novels – must remember that real life doesn’t need to be so stressful!. I just rang up Icelandair – guess who booked their flight from New York to London going by way of Iceland? But they said, not to worry, there’s far less problem over Iceland than there is over the rest of Europe. Smart people, Icelanders – they know the way the wind blows! Here’s me in one of my steampunk costumes. 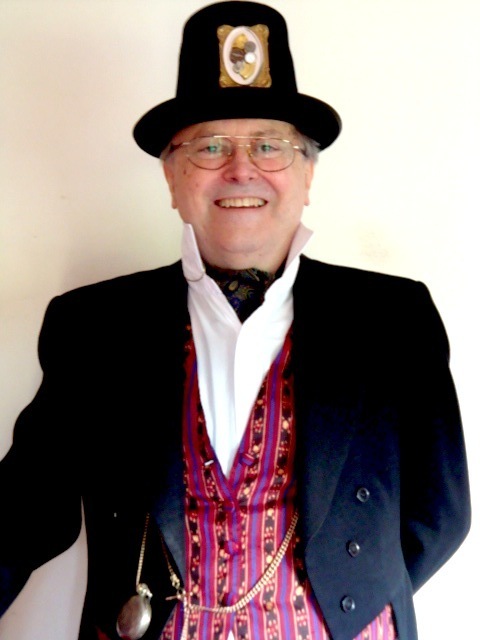 I think I’ll be wearing my tailcoat as everday dress on the tours – it’s very heavy, and I can’t afford the baggage weight of another jacket. Either I’ll convert the world to steampunkery or they’ll throw eggs and tomatoes at me. This one was for Cat, who asked for a post on narrative drive. ‘Beware the sagging middle’ refers to the middle of your book. There’s quite a lot on Narrative Drive out there on the web on writers blogs. Here’s a post about The Hero’s Journey. This offers building blocks, ‘beats’ to hit to construct a plot. And here’s one from SFF net on how to tighten up that sagging middle. They talk about structuring the middle of the book. And here’s another one on how to rescue your sagging middle. They say a well balanced story will have four main through lines and offer help on writing an outline. And there’s Richard’s Writing Tips. He has a whole section on Story, specifically on Middles, with lots of useful tips on reversal, subplots, overlapping waves and rising tide. For me writing is less about planning and much more organic. For me, the thing that gives a book narrative drive is the Worry Factor. The ROR writers will recognise this term from our critiquing sessions. What is the worry factor? It’s the thing that keeps me turning the pages long after I should be in bed fast asleep. And I keep turning those pages because I’m worried about the characters. So first of all, you have to capture me with a character that I fall in love with. I don’t mean love as in ‘desirable’. The character can be irascible, as long as hey have redeeming features. In fact I prefer characters who are less than perfect, quirky is good, tortured is better. Once you’ve got me hooked on the character, you’ve got to make me Worry about them. Give them a problem, more than one, preferable big problems. Give them secrets they don’t want anyone to find out. Give them hidden threats they don’t know about. Give them blind spots, so that they can’t see the looming disasters that your reader can see. Give them friends they trust who will betray them. Give them the best of intentions, that will lead to disaster. Give them powerful reasons to do terrible things. But most importantly, make them SUFFER. This is the Worry Factor. If I have to keep turning the pages to find out what happens to the character, because I care about them, you’ve captured me. 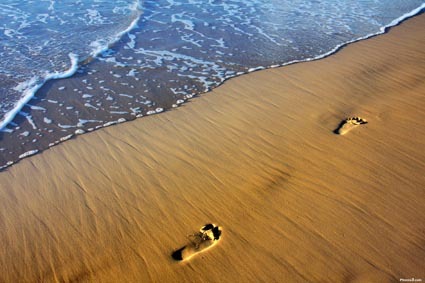 Why is there a picture of bare foot prints in the sand? 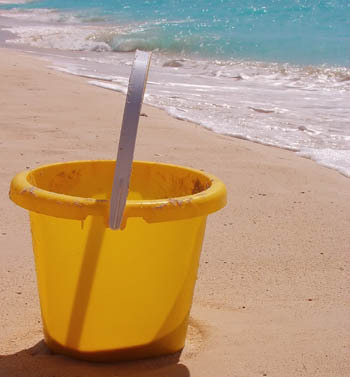 Because there’s no worry factor unless we care about the person who is walking along the beach and we know there is a big wave is coming to sweep them out to sea. Can you think of a book that you’ve read recently, that you couldn’t put down?